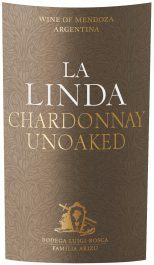 Terroir: Sourced from Bosca’s La Linda vineyard in Lujan de Cuyo. Vines average 30 years and sit at an elevation of 960 meters. Soils here are well drained and shallow based with a mix of clay, limestone and silt. Delicate bright yellow color with green and golden reflections. Intense fruity aromas that bring memories of pears, green apples and white peaches, all denoting youth. Fresh and fruity palate with marked acidity.